Bassam (Sam) Haddad has been a building automation and control systems professional for 27 years. He founded HDC Automation in 1999 to be a building automation company that is based on the open control systems concept. He continuously worked on educating owners and the engineering community on the meaning of open control systems. After almost 20 years in business, the open concept has become main stream; HDC Automation continues to design, install and support building automation systems in enterprise, commercial and industrial facilities based on the original open philosophy. Over the last few years, HDC Automation services have also evolved into the role of a Master Systems Integrator where experience in building systems, technology, and customer advocacy come together for a perfect fit. March 19 Interview with Darrell Driver, General Manager, Manitoba, for BSD Solutions. 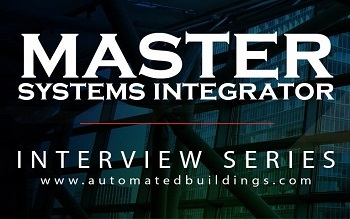 February 19 Interview with Scott Papay, Sales Manager, Building Automation at LONG Building Technologies. This month (April 2019), he interviews Bassam (Sam) Haddad, founder of HDC Automation. Haddad: There was a clear vision that started almost 20 years ago, that through serving our customers’ building automation needs with a consistent and clear message about open systems, we would position ourselves in a unique space while most of our competition would still be trying to push through with the old proprietary business model. In the beginning, little did we know that once we arrived at this space, that it would actually have a name. Let alone Master Systems Integrator. We recognized that through technology, the traditional business model will be disrupted. We recognized that Niagara was that technology from the very beginning. We made a commitment to invest in training and to stick to technologies and brand products that are proven and adhere to the open systems concept from both, technology and marketing standpoints. This philosophy led to longstanding and strong relationships that are built on trust. Over the years, we learned how our customers do business and recognized ways where we can help them make better choices and find solutions in the areas of our expertise. That’s how we organically became an MSI. Haddad: First and foremost, a clear vision of who you are and what your roles are. There are two main roles of an MSI: A technology expert and a customer advocate. A good MSI needs to stay connected to the latest building technology trends and, when possible, influence them. A good MSI values the fact that their customer has entrusted them to be a protector of sorts, and helps them make decisions that puts their interests first. This definition has an underlying message of who is in a position to be a true MSI, and who isn’t. Another important characteristic of a good MSI is to recognize and to leverage the power of being connected. Our industry partners that make a network of manufacturers and distributors, at whose lead is Cochrane Supply and Engineering, play a big role in strengthening and supporting our offering – a key component that enables us to compete, and compete well, with large competitors in the marketplace. Haddad: As mentioned before, our role as an MSI has been a natural result of longstanding relationships with our customers. We have seen, however, potential clients who have recognized a need for the professional services of an MSI. It has been interesting to see the different approaches taken to procure the MSI service. In most cases, a consulting engineer is hired to qualify this service. This is where things get interesting because most consulting engineers don’t fully understand the role of an MSI. Part of the responsibilities we take on is to educate the consulting engineering community about the role an MSI plays. The concept is no longer as foreign as it used to be, but it still poses a serious challenge for consulting engineers when it comes to qualifying such a service. Our MSI services are usually retained under a professional service contract. Much like a consulting engineer. R&D: Approximately 10% of dedicated time is spent in research and development. Not counting time spent looking for and finding better ways of doing things on the job every day. This includes formal training and custom training like time spent with industry experts and software developers. It is good to know how to do things and solve problems. It is even better to learn how to take things you do further, learn new solutions, and keep up with technology features. Continuous learning must be an integral part of any professional organization that seeks to be a leader in its industry, just like a professional must continuously seek knowledge to further their career in a quest to become an expert at what they do. Consultation: Approximately 25% of time being involved in design and study phase of client projects, consulting on solution development, and general processes reviews. Haddad: If I had to pick one challenge, it would be the common challenge that all Master Systems Integrators face: Being a liaison between our traditional customer, the Facilities Department, and the IT Department of any given customer. Every MSI must rise to the occasion of being the effective communicator and mediator between these two entities. After all, we (our industry) are the ones who ordained their marriage. Haddad: A prominent Tridium expert recently stated that there are BAS installers, and there are Master Systems Integrators. I am proud of the fact that we have always been strictly BAS installers and building control experts, not a mechanical service company with a side business in such. The natural next step for us is to be a purely Master Systems Integrator professional service company. We are on a ride, and that’s where technology is taking us. This is a unique field to be in. The first and foremost reason for that, is that it is FUN. The proof for it is the young generation of college graduates that get exposed to our world through the COOP program we have at HDC Automation. Invariably, each and every student gets excited at learning what it is that we do, and where technology is taking our industry. This is a key element in finding and retaining talent. What’s even more promising is that some colleges and universities are now offering new programs that combine the disciplines of computer science and engineering, preparing students perfectly for our industry. Without a doubt, we will continue down this path. Always looking to become better at what we do and to value our relationships with our customers and with our industry partners. To dive deeper into the topic of Master Systems Integration, current trends to utilize in your business, and future trends to prepare for now, don’t miss out on your opportunity to attend Controls-Con 2019! Controls-Con will take place May 2nd and 3rd, 2019 at the MotorCity Casino Hotel in Detroit, Michigan. This fast-paced, education-packed event brings together hundreds of integrators and end-users from throughout the United States and Canada to explore the latest technologies and possibilities of Building Controls and the Internet of Things (IoT) in commercial and industrial buildings. Learn more.